Our sweet delight for the day is the macaron. In basic terms, a macaron is made of two rounded meringue-based biscuits that hold between them, like a sandwich, a creamy filling. Macarons may come in various flavours (e.g., lemon, coffee, strawberry, caramel-fleur-de-sel) and appear each in a colour associated with its flavour. But from here on, the whole difference lies between a good-quality macaron and a mediocre one: How brittle are the top and bottom biscuits, finished with sugar glazing on surface and crispy edges? How soft and tasty is the filling in match with the biscuits? And how well does the whole composition melt in your mouth? A fine colourful arrangement of macarons on display in-store can be a visual celebration to our eyes; and the choice of flavours for making them is an excellent ground for creativity and ingenuity. 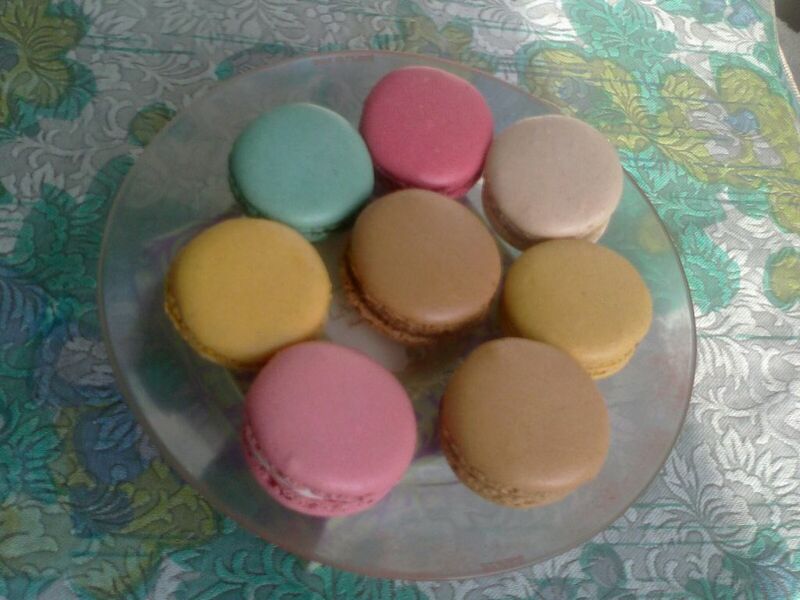 Macarons were developed in the form we know them today in the 1950s and 1960s. However, they have become so popular and ubiquitous in just the past five to ten years. The macarons are French in origin; according to some differing narratives they have gone through a few forms since the 18th century and until reaching the one most familiar now. The traditional fillings were ganache, buttercream or fruit jam, but the range of flavours currently available is much broader. Much of the credit for the rise in demand for macarons in recent years, so it appears, belongs to the French patisserie and confectionary maker Ladurée whilst being under the ownership and leadership of the Holder family since 1993. Louis-Ernest Ladurée originally founded his tea room and patisserie in Paris of the late 19th century; the founding Ladurée family developed its successful recipe of macarons sometime before or around the mid-2oth century. Their single venue was located on rue Royale near Place de la Concorde. The acquiring Holder family relocated its flagship venue in 1997 to the Champs Elysées and established under one roof a shop, a café next to it, and a restaurant (on its second floor). Moreover, the new owner has been investing with dedication in elevating the Ladurée brand. Their international expansion started in 2005 with London and have since spread to cities in Europe (e.g., Milano, Dublin, Zürich), the United States (New-York), Middle East (e.g., Beirut, Doha), Asia (e.g., Seoul, Hong-Kong, Shanghai) and Australia (e.g., Sydney), covering nearly 30 countries aside from France. They have, furthermore, a strong presence on the Internet in a fine brand-designed group of websites with vending functionalities. It would do unjust, however, to suggest that good macarons in Paris come only from Ladurée. Fine and tasty macarons may be easily found in numerous venues across the city, particularly at chocolatiers and patisseries (e.g., Pierre Hermé, Fauchon, Maison du Chocolat). Some are better known confectionary and pastry makers, others may be less specialised vendors, so one has to try a few macarons to find out which he or she likes best. The increase in popularity, nevertheless, has motivated bakeries and confectionary makers in other countries to produce locally their own macarons, and there indeed consumers should take greater care to find truly good-quality macarons. There is also a bundle of recipe suggestions for macarons on the Internet. Macarons have become particularly trendy in the United States. It is said that Americans welcome them as a replacement for cupcakes that went out of favour. But then the question is: Are macarons adopted in the US just as a hip that will fade away after a couple of years or are they there to stay. Macarons are most likely to stay popular in their home country, France, and probably also in some of the European countries, depending on how deeply such treats are rooted in those countries’ culinary cultures. What probably makes Ladurée different, except for the high-quality of its macarons, pastries and other treats, is the carefully built strength or equity of its brand. It is created and maintained around the prestigious decorated flagship venue, the selection of its physical locations, and its websites. 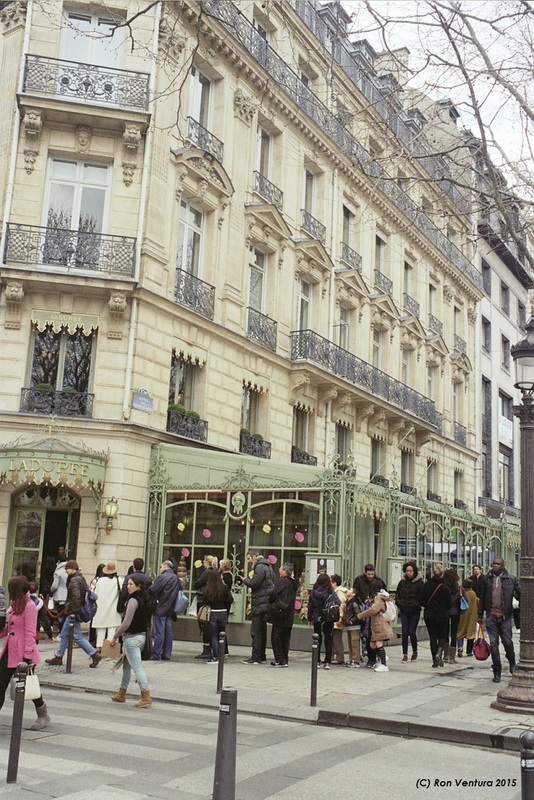 People stand in line outside its main shop to buy their macarons. Alternately, connoisseurs may sit in its café on Champs Elysées, enjoy some of their delicious pastries, and order a take-away pack of macarons, chosen from a special menu card, to be carefully packaged and brought to the table. They have a boutique shop-in-shop at Printemps upscale department store. Ladurée also collaborated in the past few years with well-known fashion designers to enhance its prestige image, especially during fashion week fairs (e.g., in New-York and Milano). There is yet a variant form of macarons, famous of its own merit, known as Luxemburgerli by the Swiss chocolate specialist and patisserie Sprüngli. Their recipe was brought-in in the late 1950s from a confectionary maker originated, as the name suggests, in Luxemburg, who collaborated with Confiserie Sprüngli. The Luxemburgli is somewhat taller than the classic macaron with more filling — it feels like a richer combination of biscuit and cream. Like many of Sprüngli’s chocolate and bakery treats, their Luxemburgerli is an artisan delight. It would be interesting to find out how Ladurée succeeds against Swiss veteran makers of chocolate confections or pastries like Sprüngli, Teuscher or Läderach. Consumers often do not feel comfortable to indulge themselves with products or services that are discretionary, and furthermore a luxury, whether it is specialty chocolate pralinés, a dinner at a top-class or luxury restaurant, or a holiday on a cruise ship. People want to feel they deserve it beforehand. In some cases, when heavier spending is required on a luxury, consumers appear to have a greater difficulty permitting themselves to enjoy an expensive luxury than resisting such temptation; they may need to precommit themselves to make the indulgence (e.g., going on a cruise for vacation versus replacing an old dishwasher)(1). The contemplation over smaller indulgences, like a sweet treat, is less demanding, yet people want to feel somehow entitled, so as not to suffer guilt and regret after the act. More elaborately, the evidence indicated that consumers feel similarly positive (e.g., enjoyable) about an indulgent experience, and incur similarly negative feelings (e.g., guilt), whether they have had a “legitimate” reason or not, and whether it occurred as a reward or as a consolation. Furthermore, as consumers get more distant in time from affective episodes they report on, such reports are more in accordance with their predictions than with their episodic memories. The prior expectations and the late reconstructed reports of consumers similarly draw or rely on global beliefs and general knowledge, unlike reports of episodic memories when consumers have “lively” access to specific memories of attributes of the product or event they indulged on and their evoked feelings. Nonetheless, people are not very good at reconciling their beliefs, predictions and experiences and hence their learning is impaired. Consequently, for indulgences that are not really luxurious, rather discretionary, consumers seemingly worry too much about being “justified” or “deserving”to indulge, and what would be their feelings thereafter, as these concerns do not coincide with how they really feel while indulging; hence they may be encouraged just to enjoy the indulgence (e.g., macarons) as it happens. The smaller types of indulgence usually do not have significant financial consequences as a barrier, but they could have other negative consequences like damaging health implications — in the case of chocolate or macarons, it could be related to high sugar levels. A consumer considering this kind of indulgence may be stopped by concern for his or her health and seek a reason to justify this “irresponsible” behaviour. Feeling sadness due to a previous event can especially attenuate such a concern before committing the indulgence, and thereof avoid it. However, not in all cases of sadness it should impede indulgence. If one’s goal is explicitly to indulge for the sake of it (e.g., having a festivity on a generous steak or a pack of chocolate truffles), sadness is more likely to highlight to the consumer the potential damages; in desire to prevent further losses to one’s well-being, the consumer is more likely to cancel the intended indulgence. If on the other hand the consumer had no such hedonic eating goal at the time he or she became sad, the indulgence is likely to be applied as a tool for moderating emotions. Specifically, it allows indulgence (e.g., eating macarons) as a consolation, helping to make one feeling better, less sad (3). Facilitating or even encouraging consumers to indulge, as in buying and eating macarons, could mean making them feel more comfortable, reduce pressure from them that could make them feel in conflict — by using messages like “enjoy the moment”, “do it just for fun”, “carpe diem”, and “it is OK to indulge even without a reason”. Yet there are additional factors that can give an advantage to a particular brand. A strong brand of fame, as demonstrated by Ladurée, has the power to cause consumers to perceive that its macarons taste even better than they may objectively be judged (notwithstanding that Ladurée’s macarons are of high-quality, nice looking and tasty). There are social effects to account for, as when people stand in-line in front of a shop, visible to others who may join them. Furthermore, an artistically impressive display of colourful macarons, in-store or better in the front window, can create the visual inducement necessary to persuade consumers to accept the temptation. Actually, having chosen the right macarons, you will not regret it. 1. Self-Control for the Righteous: Toward a Theory of Precommitment to Indulgence; Ran Kivetz and Itamar Simonson, 2002; Journal of Consumer Research, 29 (Sept.), pp. 199-217. 2. Do we Really Need a Reason to Indulge? ; Jing Xu and Norbert Schwarz, 2009; Journal of Marketing Research, 46 (Feb.), pp. 25-36. Pleasure Principles: A Review of Research on Hedonic Consumption; Joseph W. Alba and Elanor F. Williams, 2012; Journal of Consumer Psychology, 23 (1), pp. 2-18 (http://dx.doi.org/10.1016/j.jcps.2012.07.003). Mouth-watering, insightful and enlightening piece!